its been years...so glad to see check your mail. you said you wanted no less than perfection...i can see this in the quality of your work. my favorite is your grenade launcher model...with the grenade sliding in at the animation end...nice one. could you upload your packs for us rouhis? i use ooppees host Free large file hosting. Send big files the easy way! its easy to set up and upload. Yeah Sendspace is great, sadly though limited downloads - which how many downloads depends on the files size. So great for the short-term or a file which won't receive insane traffic. .....I have that bookmarked with the title "Q1 Uploads - PW ilovetheshubhub" and I NEVER remember to actually use it. just a quick check, what models are actually missing at the moment? so basicly thats each and every item/weapon/etc model and a few monsters, witch have now been lost? Last edited by Ruohis; 02-25-2011, 11:16 AM. also from my side: A big warm welcome hug ! Beeing a great fan of your models, I also used them for some experimental modifications. I think your Armor is what kingennio has mentioned is the one that is missing. best would be, if you could upload your complete pack. I followed every step you made back in 2007/2008 in your forum. From that time I know that you made many many different variations for almost all of your models. Thats what i loved about them: The different versions. So you could pick the one you like most. I am extremely curious about your monster models. You must know that we have a very talented person here: OoPpEe. He can bring every dead model to live ! Last edited by Ruohis; 02-21-2011, 07:46 AM. 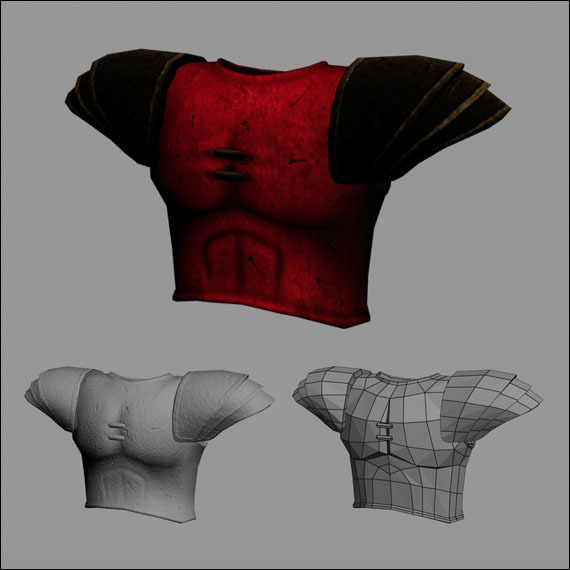 this is at least some version of my model, had one version witch was hollow inside, and at least 3 different version of the shoulder pads... sizes and shapes, don't remember witch was the final..
Last edited by Ruohis; 02-21-2011, 08:00 AM. Last edited by seanstar; 06-29-2012, 05:44 AM. well done seanstar! Maybe I can finally complete my ruohis++ pack by putting in there your tweaked version of Ruohis' armor. I really like the gloss and normal you've made! Last edited by kingennio; 03-01-2011, 04:51 AM. Very nice! I am using, although I made my own gloss. Yours is great but it made it stand out too much compared to the other models I made, so made a custom. Just from looking myself - he took the diffuse texture, put it into CrazyBump, then chose the right option. Once loaded - click the specularity tab. yeah its the metallic color setting in crazybump. It's starting to become REALLY hard to believe this is the old Quake engine anymore guys!!!! Yep this model is amazing - the only improvement it needs is the "seams" are very visible.